In Sacred Voices, you’ll discover a more peaceful, meaningful way of life and develop a powerful sense of self-worth by being taken into a world you never knew existed. Wolf Moondance will take you within yourself through ancient meditations and ceremonies. She’ll take you on a journey of self-discovery that has promoted spiritual growth for hundreds of years. Whatever happened to a simpler approach to life? Whatever happened to our appreciation for the land, the air, water, animals? Where did human beings take such a brutal turn where money, possessions, power and control all became the priorities in society? Do you ever long for the time where life was simpler and developing inner spirit and cherishing family was tops on your daily to-do list? Well, you can get back there through the teachings of one who has had them passed down for generations. Now, revealed to you will be the closely kept secrets of the Native American Indian. Learn the power of sacred ancient ceremonies and Native American music. Learn how to make a medicine bundle and prayer ties. Discover the Native American traditions of honor and respect for family. Learn about medicine terms, healing stones, animal totems, and other sacred objects to make and use and how to create a sacred space for prayer and reflection. Meet your own personal spiritual guide who will help you in your daily life. Learn how to combine your beliefs with that of the Native Americans for a healthier, more peaceful existence. 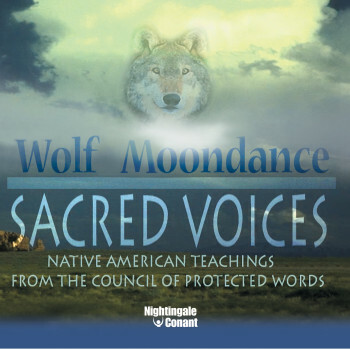 In Sacred Voices: Native American Teachings from the Council of Protected Words, you’ll discover a more peaceful, meaningful way of life and develop a powerful sense of self-worth by being taken into a world you never knew existed. At one time, this world brought all people together to develop a spiritual sense of self and community that everyone could benefit from. In this program, Wolf Moondance will take you within yourself through ancient meditations and ceremonies. She’ll take you on a journey of self-discovery that has promoted spiritual growth for hundreds of years. Meditation, prayer, music and journal keeping, along with special words of prayer and power, will help you find your path, add direction to your life, open your mind and spirit, balance your emotions, get in touch with your body and explore your creativity through the ceremonies of growth, truth, wisdom, impeccability, and the sacred quest for the whole self. Everyday perceptions will take on new meaning as you discover the Native American understandings and the spiritual qualities and powers of colors, animals, plants, minerals, insects, celestial bodies and the environment. Each session features a story, a ceremony, prayer and a vision to help you become more deeply in touch with the "dance of life" and takes you into the world of spirit, where you are both physical and spiritual, a person who stands on the earth and hears the song of the wind. In sessions like The Grandparents Speak, Understanding the Wolf’s Eyes: Your Search for Truth, Everything’s a Ceremony and many other lessons, you will experience choice and change that will bring you opportunity, protection, dreamtime and transformation. Let Wolf Moondance show you how to live the best life possible! Join her on this spiritual journey to wholeness. May spirit fill you as you follow the good red road.